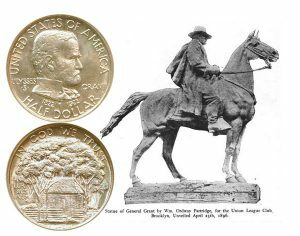 Today, the Grant Commemorative Silver Half Dollar Coin remembers when the Union League Club unveiled the equestrian statue of the man on April 25, 1896. Though his birth date was April 27th, they presented the statue to the city on a Saturday with all due reverence and ceremony. The most recent Grant monument, excepting the Riverside Mausoleum, and probably the best equestrian statue of the great commander that has ever been made, is that by William Ordway Partridge, which adorns the city of Brooklyn, N. Y., an excellent illustration of which we present upon this page, and which was prepared expressly for the Christian Work. This monument was presented to the city of Brooklyn by the Union League Club, and was unveiled with civic and military ceremonies one year ago. On Saturday, April 25, 1896, there was unveiled in Bedford avenue, near Dean street, Brooklyn, directly in front of the Union League Club house, a bronze equestrian statue of General Ulysses S. Grant, a gift from the Union League Club to the City of Brooklyn. The statue represents General Grant on the battlefield, and is pronounced by prominent members of his staff and others who have often seen the General in active service, as strikingly lifelike. The pedestal on which the statue stands is a granite block, sixteen feet high and weighing over one hundred tons; the base, also of granite, weighs twenty-two tons. The statue itself is of bronze, and is fifteen feet eight Inches in height. The date, April 27, is the anniversary of the General’s birth. The idea of erecting this monument originated with some of the war veteran members of the Union League Club; committees were appointed, funds obtained and Sculptor William Ordway Partridge was requested to prepare the model. Mr. Partridge has performed his task well. The statue is a lasting tribute to his genius and a valued ornament to the city; no other municipality in the Union has so fine a statue of the illustrious soldier or one which appeals in its realism so directly to the hearts of the people. The committee of the Union League Club in charge of the Grant statue work consisted of Benj. F. Blair, chairman; Marshall T. Davidson. vice-chairman; Howard M. Smith, Henry C. Larowe, Andrew D. Baird, Chas. G. Bennett, Eugene G. Blackford. Abel E. Blackmar, Alonzo Brymer, J. G. Dettmer, Ethan A. Doty, Abner S. Haight, Edw. H. Hobbs, H. B. Masters, M. W. Morris, Geo. A. Price. C. H. Russell, Chas. A. Schieren, C. W. Seamans. Frank Squier, Leonard R. Welles, Francis H. Wilson, Stewart L. Woodford and Fred. W. Wurster. The parade, which was reviewed by Governor Morton, was led by Grand Marshal Geo A. Price and Lieut. Harry E. Smith, U. S. A., adjutant general and chief of staff, escorted by twenty-five members of the Riding and Driving Club on horseback, under the leadership of Colonel John N. Partridge. The First division of the military was composed of United States regular troops and marines with the Fort Hamilton and Governor’s Island bands, and commanded by Lieutenant Colonel M. P. Miller, U. S. A. The Second division, commanded by Brigadier General James McLeer, consisted of the Second Brigade Signal Corps, under orders of Captain F. T. Leigh, the Forty-seventh Regiment, commanded by Colonel John G. Eddy; the Twenty-third, commanded by Colonel A. C. Smith; Thirteenth by Colonel William L. Watson; Fourteenth, Lieutenant Colonel Kline; Third Battery, Captain Henry S. Rasquin, and Troop C, Captain Bertram T. Clayton. Grand Army of the Republic posts composed the Third division; they were commanded by Brevet Major-General Isaac S. Catlin (retired), grand marshal G. A. R., accompanied by his staff, and thirty-two posts. The Fourth and last division, commanded by School Principal William L. Felter, of School No. 15. consisted of the American Guard, composed of boys from Public Schools Nos. 11, 16, 44, 78, 83, 90 and 109, and the Cadet Corps of the Hebrew Orphan Asylum, Captain Isidor Fauerbach. The American flags which covered the statue were removed by Ulysses S. Grant, 3d, the son of Colonel Frederick D. Grant, and grandson of the General. The ceremonies were opened with prayer by the Rev. Dr. A. J. F. Behrends, chaplain of the Thirteenth Regiment. General Stewart L. Woodford, on behalf of the Union League Club, presented the statue to Mayor Frederick W. Wurster, representing the City of Brooklyn. General Horace Porter delivered the oration, sketching in a masterly manner the career and services of the great soldier. The Right Rev. Charles E. McDonnell. Roman Catholic Bishop of Long Island, pronounced the benediction. 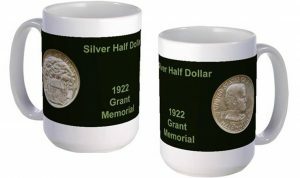 The Grant Commemorative Silver Half Dollar Coin shows with an image of the statue erected in Brooklyn.